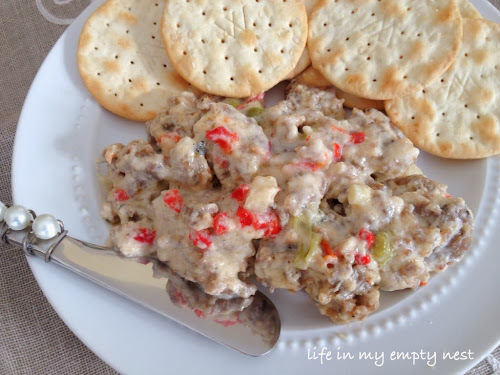 When asked to bring an appetizer to a couple's dinner over the weekend, I thought of this hearty and creamy sausage dip that I used to make quite often, but for whatever reason, have not made in several years. I tend to get in an appetizer rut of sorts, but need to remember to pull out those trusty old favorite recipes - after making, you remember how good they were and why they became a favorite! drippings and add all remaining ingredients except one green onion. Pour into one quart baking dish. Bake 20-25 minutes until bubbly. Oh that sounds YUMMY:) Thanks for the recipe! Have a blessed day dear Vicki, HUGS! My neighbor lady was JUST talking about this dip! Now I have the recipe--thank you!!! Sounds amazing! Hubby would love it for sure. There are some nights on the weekends when a heavier appetizer is perfect for a light dinner. Sounds very good! SAVED! Thank you . . . This is one of my favorite dips. I don't make it a lot because it is so darn good and the calories are in the thousands by the time I serve it! Sounds yummy; I bet the Great Scot would love it! A friend of mine makes a recipe just like this but spreads it on slices of cocktail rye bread then sticks them under the broiler for a few minutes. I'm going to have to suggest she make that for our next girls' night in! Great recipe! I can't wait to try it. My husband loves sausage and this is right up his alley. Yummy! This looks so good. I think I'll make this for an appetizer during the game this Sunday! This looks good. I'm on the lookout for super bowl appetizers! Your sausage dip sound so yummy! Thanks for linking up to Saturday Dishes. I Pinned it! Hi Vicki, I thought this was going to be the sausage dip with rotel which I love, but it's different. Pinning and will give it a try sometime. I am often making appetizers. Thanks for sharing with SYC. yummmmmmmmmmmmmm.. I love anything with sausage in it and this recipe sounds easy enough for me.... thanks so much..
Oh my goodness... this is my kind of dip... and it's lo-carb! FABULOUS! Thanks for sharing your yummy recipe at THE SCOOP! Oh, my goodness~I love every ingredient in this dip. It sounds so wonderful and tasty! I can't wait to try it! I'd love for you to stop by my Super Bowl Eats and Treats Party and link this up, along with anything else you think is a "must have" for Super Bowl Sunday! Hot Cream Sausage Dip - wow that sound delicious. Thanks for sharing at Saturday Dishes. Thoughts for Thursday...downton, diabetes, etc. Thoughts for Thursday...breakfast, books, etc. Thoughts for Thursday...downton, gifts, etc. Thoughts for Thursday...cold, cocoa, etc.